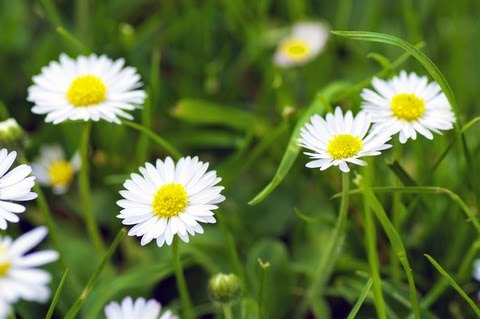 What’s most noticeable in the lawn this month is the proliferation of weeds appearing and whilst not unattractive the lawn daisy, together with other broad leaf weeds such a plantains, need to be dealt with now. Leave them and they flower and seed, spreading through the lawn. Applying lawn sand weed killer is a good remedy whereby the chemicals remain on the broad leaf, scorching and killing the plant, whereas the sand slides off grass blades. Hormone weedkillers or three or four in one treatments such as Evergreen will also do for treating moss and other weeds while feeding the lawn. Frequent grass cutting, probably once a week, will be needed now and it’s important to set the garden tractor deck or mower at the right height. Too low and you scalp the grass; too high and the grass get long, then weakened when it’s close cut which is a sure encouragement for weed growth. Top dress lightly with soil any areas where you need to even up depressions in the lawn (see April’s Gardener’s Journal for top dressing). For larger lawn areas a powered trimmer or edger will greatly reduce the workload of keeping lawn edges tidied. If it’s dry where you are this month you may need to give the lawn some watering.